We have reached the conclusion in the series of SEO for Food Bloggers. I have received many questions and comments from a lot of you so thank you for reading! And keep the questions coming, I’ll help where I can! 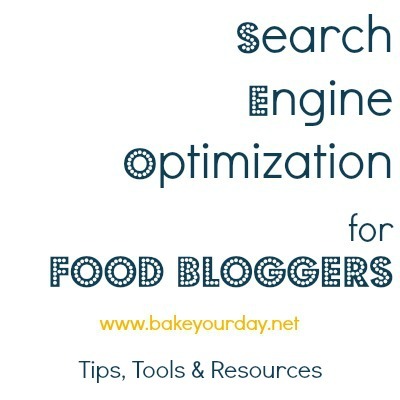 Today I want to wrap up with some final tips, tools and resources for search engine optimization. Most of these have been sprinkled throughout the former posts but I wanted to compile them all in one place. Ask yourself this question: Who are you writing for? Think about your readers, their interests and the things that they (or anyone!) might be searching for and implement the keywording, linking and recipe format strategies we have discussed in the past. Use Google+ (do I need to do a post on Google+? I don’t know much but will share what I’ve learned!) – I believe that Google+ will become essential when it comes to good SEO practices, especially for recipes! Let’s talk a minute about SEO Plugins. I have mentioned in them in a past post but want to go into detail. From what I can gather and/or understand, I don’t believe that the plugins really do a ton to help your site talk to search engines. What I think they do is to help us as the blogger create good SEO practices by providing us fields that we need to fill in. The very top shows a “clip” of what the entry might look like in a search result. Focus Keyword: this is what the post is about. I end up repeating this several times throughout the post; it also shows up in my post title, recipe title and in the URL. SEO Title: This is the title that shows up on the top of the browser and the title which will show up in a search result. Keep this short and sweet and put your blog name (if you included it) second; post name/recipe name first. Meta Description: Do not skip this one! This little space which fits 156 characters is the description that will be used in search engine results. If you don’t fill this out, you might be missing out on grabbing someone’s attention. If you click the tabs at the top, the “Page Analysis” will give you indicators on how your post is set up to succeed in a search – and it does so by green, yellow and red “lights” and I LOVE that part! Settings: this plugin has so many settings and to be honest, I haven’t changed much from the default settings. If you have a question about a setting, please email or leave a comment below! If you use the All-In-One SEO pluging – please email me if you have questions. I used to use it but found that I prefer this one because of the page analysis tool and because it only allows one keyword. I’m happy to help in any way with the other plugin – I know many bloggers who use it and love it! Develop a brand in the way your posts are formatted (paragraphs, recipe formats, photos, photos with words, photo style, recipe style, linking internally, linking externally, etc.) and be consistent. Consistency ——–> good search engine optimization! Any questions? Comments? Send them my way. What other “Blogging Bites” posts would you like to see? Google+? Working with Brands? Social Media? Send your ideas to me and I’ll add them to my list! Thank you for such a great series, Cassie!!! I have loved this series Cassie! And I love Yoast, too. It’s been very helpful at getting my good SEO practices down. Thanks so much for all you’ve taught me! I am loving this series too Cassie!!! Thanks! Cassie I don’t use an SEO plugging. I think I might start using one just for the good SEO practice! Thanks for sharing your knowledge! Loved the series and my #1 problem of not being able to get images to show up…no matter what I do and yes, I fill out that online link form that shows me where my ‘mistakes’ are…but I can’t seem to fix it. It’s all so circular and hard to decipher. I have tried, tried, tried and tried some more to no avail to get those images to load with the google search results but it eludes me. Maybe one day 🙂 Thanks for doing this series, Cassie! Google Plus…just recently signed up (after resisting) but haven’t done a thing with it…more social media that I always wonder if I ‘need’! Great series Cassie! You’ve provided us with so many helpful tips. Thank you, thank you!! I loved this series! So much helpful info. I would love a post on Google+! you have provided good tips thankz. U can as well bookmark this link and others on my site for more traffic under food category. This has been so great, Cassie! I downloaded the Yoast plugin after you mentioned it and have been having issues getting the green light until this week finally! I would be interested in a post about Google +. It’s just so hard to keep up with so many different social media platforms. Cassie – I’m so glad you went back over some of this. Although I hadn’t realized it when you first mentioned WordPress SEO, I realized this morning that I’m using a different type of plug-in that definitely does not provide as much great information as the one you recommend. I just switched over this morning, and I’m so happy with it – it’s so useful to have those green, yellow, and red dots to show you how to make improvements! Again, thank you for the great advice. Really good tips 🙂 SEO can help almost any business and really is worth putting the time and effort into. Yoast rocks! It’s so powerful and works like a charm. Thanks for all your tips Cassie. Thanks for all the time you’ve put into this series. It has been very helpful to me as a new blogger. I am so awful when it comes to SEO, Cassie, so you have no idea how helpful this series is! Thank you so much for sharing!!! Another great post. I really need to make the move to WordPress! Loved this series, great job with it. Thanks for all you taught me! Absolutely loved this series! Thanks so much for posting, this was very helpful. Loved the step by step instructions! Thank you so much for this series! We just started our blog so it’s nice to have ideas on getting the SEO running right from the start instead of having to go back and edit everything later. Very good series of articles on SEO. It is very obvious that any business wants to do businesses online needs to build a good SEO strategy for the organic traffic for his business website/blog. Being an optimizer and trainer I can say that SEO has changed a lot in recent years and should be done with much care and knowledge. Thank you so much, just came across this series and found it super helpful! Thank you SO much Cassie for these accessible and simple tutorials. I really appreciate that you took the time to do this! Thank you very much for this amazing tutorial! You did an amazing job of putting all necessary information in one place, making it easy accessible and not overwhelming the reader with info! I am just starting my own blog and your series helped a lot but also inspired me a little. So thanks a bunch!! Great típ, it’s many helpful. thankyou and thankyou! This was a great series. Thank you so much! I’m a little late to the game, so hopefully you are still around to answer a question. I tried the Structured data tool, which was great. But it came up with two errors. 1: that I I don’t have an aggregate rating. I’m guessing this is the stars that people can use to review the recipe. But since I don’t have much traffic yet, I haven’t had any reviews. 2. The nutrition data is missing. I am using a free recipe plugin and the nutritional data is only available with the paid version. My question is: will having these two errors (with everything else being ok) hurt me in google’s recipe rankings/listing? I don’t think either of these things will have a negative impact over time. I have never included nutrition facts and know many bloggers who do not include that information. I am also not familiar with the aggregate rating but I think that will happen over time as your traffic grows. thanks for reading!